Reach Your Full Potential with a Great Set Up! What is the number one thing you can do today to improve your golf score? Some would say "play or practice more" and others might say "hit it farther or straighter". Both are great answers, but the truth is, the best thing you can do right now to lower your score is improve your set up! If you look at any tour caliber player (male or female) you will notice they all look very similar in the set up position. It's almost like they all read Golf 101 "The Set up". But, as an instructor, a poor set up is the #1 issue I see among the majority of amateur players. 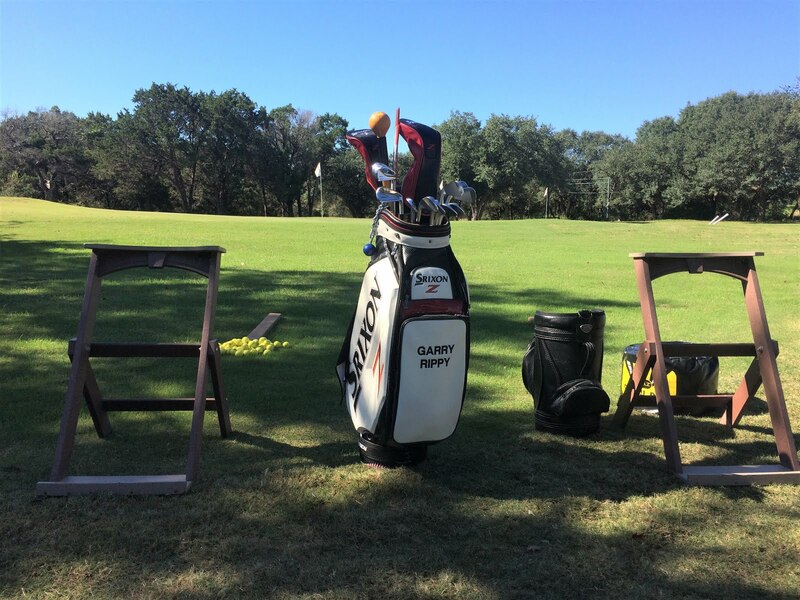 A great set up will allow you to reach your full potential as a golfer! 1. 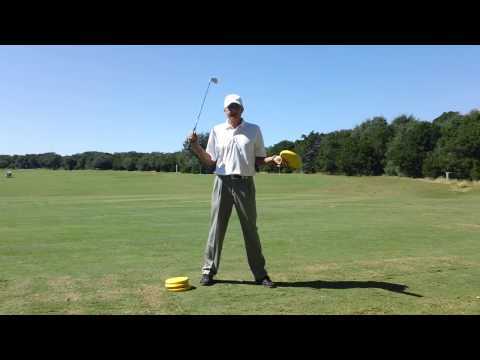 Without a club, I want you to stand erect with your feet shoulder width apart. 2. Now raise your arms about shoulder height and place the palms of each hand together with the thumbs pointed up. You have formed a triangle between the arms and shoulders. 3. The goal is to now get the arms or triangle to hang in front of you. To accomplish this first lower the arms until your chest stops them. To get them to hang in front of you, bend from your hips as you let your shoulders drop forward. Try to maintain a fairly straight but not stiff back as you do this. When the arms are hanging straight down from your shoulders, this is where you stop. 4. Now put a small amount of bend in the knees, relax the arms and put your hands in a golf grip position. 5. Your weight should be balanced left to right and back to front. After repeating this exercise a few times, have a club nearby and place it in your hands after completing the last step. It won't be long until you can get in this athletic position every time with a club in your hands. Here is a front view of the proper set up. One thing to note is the position of the right knee. Even though I am balanced, I do put a little pressure on the inside of the right foot to keep me centered over the ball on the backswing. This move also allows me to turn and not sway on the backswing. I do this by positioning my right knee about 3-4 inches inside my right foot. Also, it is plain to see the "triangle" formed by my arms and shoulders. From a down the line look, it is plain to see my arms hanging from my shoulders. Also, my head is in line with my spine and my chin is not buried in my chest. My knees have a slight bend to them and they are just above my shoelaces. It is not a coincidence the club is setting at 90 degrees to my spine. If my hands were too high at address or above the green line, this would cause too much tightness in the wrists and prevent me from hinging my wrists properly at the top of the swing. I recommend to check your set up position in front of a full length mirror. Once you associate the correct feel with the correct look, you will be able to duplicate your set up on the course. Let's briefly look at how a good set up effects the swing. A great set up allows me to turn to the top and maintain my original spine angle. Note how my right knee stays braced, yet my hips have turned in the backswing. 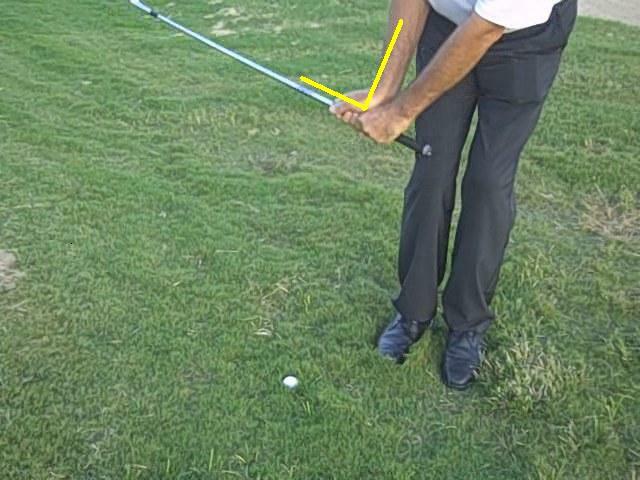 This position produces power and accuracy! into the brace of my right leg, it is easy to get off my right side and onto my left through impact. This is evident by the right heel releasing from the ground through the hitting area. Reading a green is like taking a long road trip; you have to use a map to arrive at your destination. In other words, from your starting point you need to observe all the slopes which will effect the roll of your ball and then plan your route. I begin the green reading process when I am approaching the green from the cart. The first thing I look for are drainage areas or low areas around the green. Golf course architects are very good at figuring how the water from a big rainfall would drain off the green. They will not drain a green into a bunker! Once I take note of the drainage areas, I look for any slopes which might take precedence over drainage areas. Again, I do this while I am walking onto the green. I am just looking at the overall slope of the green when I do this. Generally speaking, your ball will tend to break to low or drainage areas around a green. Once I have gathered this information, I need to get more detail. I will look at the putt from all sides. This just helps me confirm the break and if the putt is uphill or downhill. Now that I have the overall picture, I will get about 5-6 paces behind my ball and look down the line of the putt. I form an imaginary "gate" on the green about half way to the hole. This gate will be about 3 feet wide and this gives me my first look at the true line I want the ball to roll down. It is similar to what the hurricane forcasters do. If a hurricane is in the Gulf of Mexico, they will inform us the hurricane could make landfall anywhere from Houston to South Padre Island. This is a big path. As the hurricane gets closer to land, they will better inform us the hurricane is going to make landfall at Corpus Christi. In this diagram, the green is breaking right to left. My ball is on the front part of the green and I formed a gate with red dots about half way to the hole. The first gate I form in my mind is wide. If you notice, the lines extended from my ball through the gate posts are well left and right of the hole. This is just my first look at the putt. I know the putt breaks to the left, so I am saying to myself if I putt over the right gate post I will miss this putt well right. If I putt over the left gate post, I will miss this putt well left. In the next diagram, I will narrow the gate and my focus to the correct line. In this diagram, I narrowed my gate to the yellow dots. I also added a yellow dot to the right of the hole which is my correct line based on the speed I am going to hit this putt. For this putt, I am estimating a 2 foot break. By narrowing my focus I am giving my self an increased chance holing this putt! Obviously you cannot put dots on the green when you are putting. But I will tell you, when I put targets on the green for my students, they hit their putts much closer to the hole. On the greens you are playing, just look for old cups, ball marks or other surface irregularities which will help you form a "gate". Now that you have narrowed your gate, you are ready to roll your ball through the gate toward the hole. But, before you make your stroke, you need to let your eyes follow your line from the ball to the hole and then back from the hole to your ball. You should actually see a curved line following the break of the putt. Once your eyes return to your ball, make your stroke. Do not stand there waiting for that magic moment. In conclusion, I will say this process should not take long and works for putts of all lengths. While your playing partners are putting you should be performing the prep work. When it is your turn to putt, be ready! Practice this process on the putting green before you take it to the course. All you have to lose is strokes! Good luck. If you look at the golf swings of past playing professionals, they were all a little different. If you attended a PGA TOUR event in the 1960's you could pick out Gene Littler by his smooth swing. You could also pick out Miller Barber by his unusual swing and Don January by his unique set up. Then came the 1970's and you could certainly recognize Johnny Miller, Tom Watson, Jack Nicklaus, and Lee Trevino to just name a few. But, as different as their swings were, they all got back to impact in very similar positions. Impact was their "moment of truth". As we moved into the 1980's and 1990's, golf swings on the PGA TOUR began looking very similar with only a handful of exceptions. Golf instruction methods were improving due to access to video and other high tech teaching aids. Players had more access to viewing their swing and seeing how they measured up to their competition. With the purses growing on the TOUR, players had to find ways to minimize their mistakes. Missing a shot or two a round would cost them money! So, they began fine tuning their swings paying attention to every little detail. I think this "mechanical" thinking produced great looking but very similar looking swings. But again, they all arrived at impact in similar positions. If you attend a PGA TOUR event now, I am guessing you could recognize a few faces, but how many swings would you recognize? You could probably pick out Jim Furyk, J.B. Holmes, and Phil Mickelson (because he is left handed), but if you go up and down the money list, there are many swings you could not put a name to. Now, there is nothing wrong with perfection, I am just pointing out in the 1960's players tended to play their own game and did not worry about what the next player was doing. In today's era, players have access to great instruction and they are taking advantage of every opportunity to improve. The bottom line is, all great players have great impact positions throughout the era's. As a teacher, I have seen thousands of golf swings. The one thing which stands out as a difference between an accomplished player and that of a 20+ handicapper is impact. Many times I will start a pupil at impact, and then work to improve their swing from there. Once you are at impact there is really only one way to take the club back to top. And, from impact, there is only one way to get to the finish. I use an impact or smash bag to teach the proper impact position. Here is a picture of David, a student from West Texas I am working with. With a little practice on the smash bag your impact position and ball striking will improve. Note how similar his position is to that of striking the smash bag. 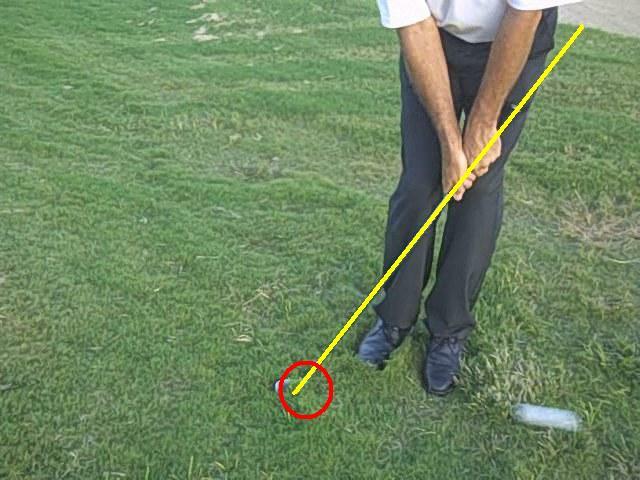 The bottom line is a great impact position will get you compressing your golf ball. The benefits for iron shots will be striking the ball first then taking a divot which means more solid contact. For the driver it means you will hit it farther and straighter! a. How many swing thoughts do you think he had while hitting golf balls? b. Did he have a pre-shot routine that took over 15 seconds? c. Do you think he was worried about the result of any the shots? d. How tight do you think he was gripping the club? e. Do you think he had a score (and I don't mean musical) in mind? f. Was he thinking about his dance steps? I think you can see where I am going with these questions. Obviously he made dancing look really easy, but he made golf look really easy as well! Being the great dancer he was, I think he was just letting his body react to the music and golf just happened to be one of his dance steps included in his routine. Every step just blended together and was graceful to watch. The key here is he was "reacting" and not "thinking" during this routine. Now, how do you think the routine would have looked if he had all these thoughts? I am just guessing, but I do not think the routine would have been near as much fun to watch. Do you feel like this could be your list of swing thoughts? Let's look at how he signed his name. His signature is free flowing just like his dancing which indicates he was holding the pen very lightly. Again, he was not thinking about making the letters, just putting the pen to the paper and letting it happen. Swing thoughts are fine on the practice tee. But, once you get to the course, you have to dance to the music. It is not the time to be thinking about your swing or results. Do you want to play golf, or play golf swing? Instead of swing thoughts, try swing "feels". In other words, try to feel smooth and easy, as opposed to thinking "don't swing hard". I am sure Mr. Astaire spent countless hours rehearsing his steps, but when it was show time, he quit counting steps and danced to the music. During your next practice session, I want you to sing a phrase of your favorite song to yourself while you are swinging. Not out loud, just to yourself. What this will do is quiet that little voice in your head that is spewing all the swing thoughts. Nick Faldo once said he would bite the end of his tongue to keep that little man from talking in his head. Once you are comfortable on the practice tee with this process, take it to the course. I think you will be suprised at the results and your swing will be much smoother. After watching this video of Fred Astaire, I think you will understand the importance of rhythm and balance in the golf swing. Enjoy! One of the most difficult shots we face is hitting out of thick Bermuda rough around the green. The technique I am going to show you will work well when the ball is sitting deep or at the bottom of the rough. I recommend using your most lofted sand wedge for this shot (57-60 degree loft). Set up: Grip down to the bottom of the grip, play the ball about 3-4 inches behind your back foot, put about 70% of your weight on the front foot, close the club face slightly and make sure your hands are ahead of the ball. Note in the picture the yellow line extending from the ball to the outside of my front hip indicating my hands are ahead of the ball. Backswing: Feel as though you pick the club almost straight up from the ball. There is no "sweep" in the backswing. Note the angle formed by my right wrist and club indicating I did not take the club back low as you would for a typical chip shot. The length of the backswing will determine how far the ball will fly. This shot will come out low and "run" to the target. Impact: It is very important to strike the ball first. With the up and down motion of the backswing there will not be much follow through if any at all. Note at impact my hands are ahead of the ball just as they were at set up. With just a little practice you will get the feel of hitting the ball first. Also, you will learn how much backswing is needed to get the ball out of the rough and on to the green. 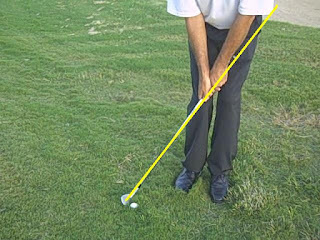 Keep in mind the ball will "pop" out of the rough with very little spin and roll most of the way to the target.